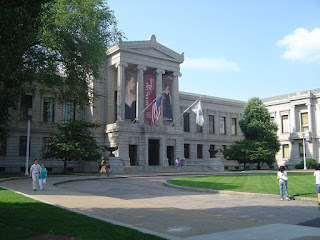 The Museum of Fine Arts in Boston, Massachusetts, is one of the largest museums in the United States, and contains the second largest permanent museum collection in the Western Hemisphere, after the Metropolitan Museum of Art in New York. The museum was founded in 1870 and its current location dates to 1909. In addition to its curatorial undertakings, the museum is affiliated with an art academy, the School of the Museum of Fine Arts, and a sister museum, the Nagoya/Boston Museum of Fine Arts, in Nagoya, Japan. 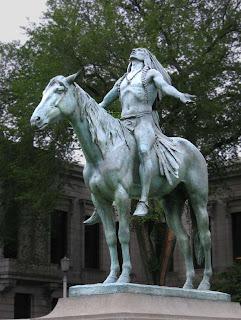 The Museum was founded in 1870 and opened in 1876, with a large portion of its collection taken from the Boston Athenaeum Art Gallery. Originally located in a red Gothic Revival building on Copley Square in the Back Bay neighborhood of Boston, it moved to its current location on Huntington Avenue, Boston's "Avenue of the Arts," in 1909. The museum's present building was commenced in 1907, when museum trustees hired architect Guy Lowell to create a master plan for a museum that could be built in stages as funding was obtained for each phase. The first section of Lowell’s neoclassical design was completed in 1909, and featured a 500-foot facade of cut granite along Huntington Avenue, the grand rotunda, and the associated exhibition galleries.